Courtesy of Coldwell Banker Res. Brokerage, Diane Miller. 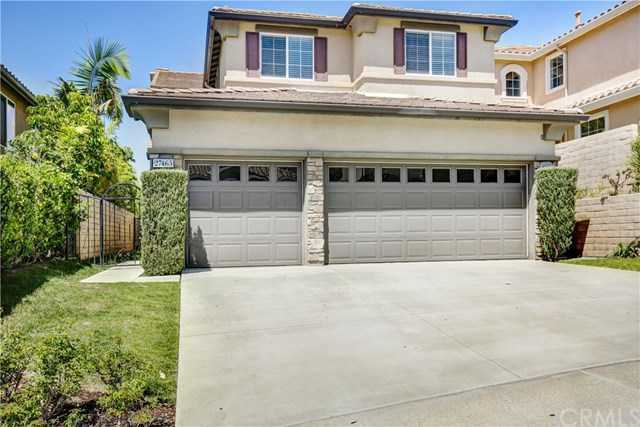 Fabulous opportunity to purchase the lowest priced 4 bedroom view home with 3 car garage in the beautiful gated community of San Joaquin Hills. This home has an expansive panoramic view including city lights at night. Located in a quiet location, this spacious home is full of natural light with soaring ceilings and numerous windows…the home exudes an open feeling and is truly a wonderful floor plan that includes a modern kitchen— with granite counters, a center island, high end appliances and pantry– that is open to the bright family room with fireplace. The downstairs also includes the always desirable main floor bedroom with bath. Upstairs features a large master suite with stunning city views and colorful sunsets. The master bath includes a double vanity, separate shower and Roman tub. Both secondary bedrooms are good sized and share another bath. Laundry room is conveniently located on this level. The beautifully designed association facilities include pool, spa, tot lot and sports court. Please, send me more information on this property: MLS# OC19083583 – $1,099,980 – 27465 Country Lane Road, Laguna Niguel, CA 92677. I would like to schedule a showing appointment for this property: MLS# OC19083583 – $1,099,980 – 27465 Country Lane Road, Laguna Niguel, CA 92677.